In Volume 1 of this series John taught his arrangement of 'I'll See You In My Dreams'. 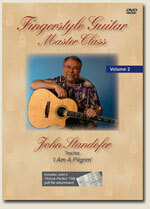 In Volume 2 he teaches 'I Am A Pilgrim', one of the arrangements he used to win the National Fingerstyle Guitar Championship. Not only do you get the 'picture-perfect' TAB and a video describing the playing of the arrangement, you also get into the head of the arranger as John takes you through the hows and whys of developing arrangements. Filmed at a class he taught at the Chet Atkins convention in Nashville. Includes questions and answers from the class attendees. Approximate Running Time: 1 hour. Includes 'Picture-Perfect Tab'.